To develop apps for Microsoft Teams, you need to be an Office 365 customer with one of the following plans. If you don't currently have an Office 365 account, you can sign up for the Office 365 Developer program to get a free one-year Office 365 Developer Tenant. This account can only be used for testing purposes. See more information on setting up your test accounts. Teams is enabled by default in the versions of Office 365 that support it, however your Office 365 administrator might have disabled it. You can confirm that Teams is enabled for your organization by following these steps. Note that each user must have a valid license to access the product. Sign in to Office 365 with your administrator account. Select the Admin tile to go to the Office 365 Admin Center. 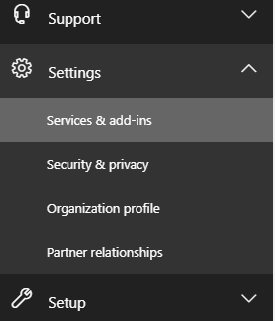 From Settings, select Services & add-ins. From the list of services and add-ins, or apps, select Microsoft Teams. On the Microsoft Teams settings screen, open Settings by user/license type and confirm that Microsoft Teams is set to On. Select Save if necessary. Now is a good time to make sure that apps are enabled in Teams so that you can upload and test the apps that you develop. Make certain that you allow uploading (or sideloading) external apps. Select Save at the bottom of the page if necessary. 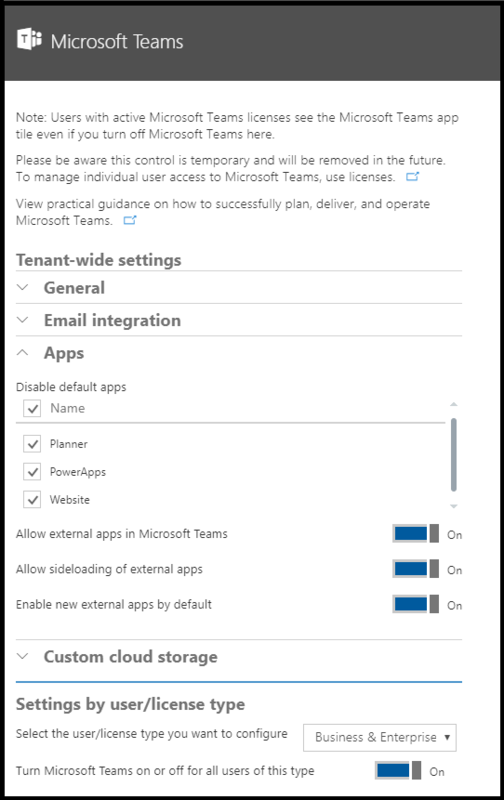 For more information on O365 administration settings see administrator settings in the Teams product documentation.